What is a Month to Month Lease Agreement? A month-to-month lease agreement is used by landlords who rent out their property on a monthly basis. What is a Month to Month Lease (MTM)? 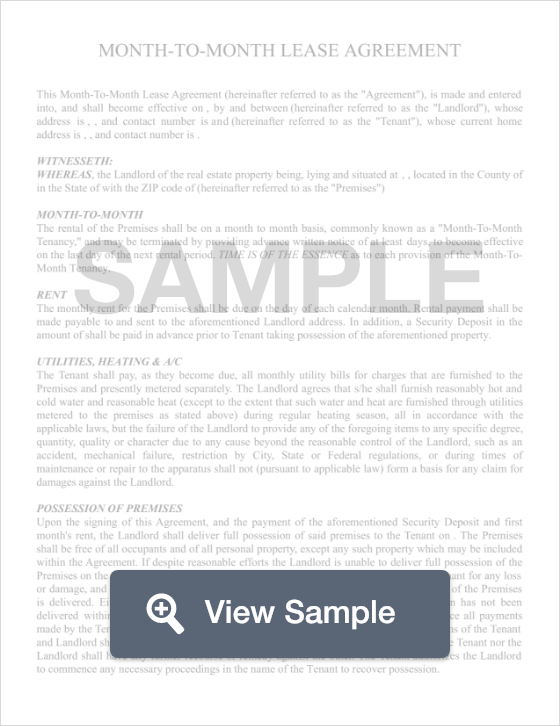 A month-to-month lease agreement is used by landlords who rent out their property on a monthly basis. These types of agreements may be used for temporary housing, college apartments, or long-term tenants who have lived in a particular rental for a number of years. They do not have a specific time period and either party can cancel it, usually with a month’s notice. As opposed to a long-term lease agreement, a MTM lease enables either party--tenant or landlord--to alter or terminate the lease on a monthly basis. Changes to a MTM lease typically require a 30 day notice. If no changes are made, MTMs automatically renew at the beginning of each month and continue to do so until either party terminates the MTM lease. Like other rental contracts, this agreement should include responsibilities for both parties, the landlord and the tenant. The lease should include financial information, such as rent amount, what utilities the renter is responsible for, repair fees, and any other expenses. It should additionally outline policies regarding pets, number of occupants, parking, and more. Both parties will need to review and sign the lease before it is officially recognized. Create a free Month to Month Lease Agreement in minutes with our professional document builder. A fixed-term lease is the most common type of lease agreement. Here, the lessee agrees to stay in the residence and pay rent for a fixed period of time (as indicated in the contract). These forms of agreements do not allow the tenant to end the lease before the fixed term without significant financial loss or termination fees. Although these repercussions do have limitations, they are not as flexible as month to month leases. A month to month lease allows the flexibility of both parties to alter or terminate the lease with a 30 day notice with no repercussions. Although this type of lease is often ideal for those who may want more flexibility without the chains of a long term lease, it does come with its own share of drawbacks. MTM leases give landlords the flexibility to raise rent, or evict tenants with the same 30 day notice. Flexibility: If you are looking to “try out” a neighborhood and are not ready to commit to it long-term, or if you think you may move within 6-12 months (either to purchase or to leave the area), a MTM might make sense for you. No Penalty: MTMs charge no penalty for breaking the lease. A MTM comes with an understanding that, at some point, either the tenant or landlord will break the lease. You can usually switch: Often, tenants with a MTM agreement can switch to a long-term lease if they choose. So if your situation changes and you want more stability in your current apartment, you can typically convert your MTM to a fixed-term lease. Furnished: It is not uncommon for MTM units to come furnished. Therefore, if you are not interested in buying an apartment’s worth of furniture, a MTM might make sense. Cost: MTMs, especially those that did not begin as a long-term lease, are often more expensive. Landlords typically offer lower rents to long-term lessees because they commit for an extended term. With a MTM, you may miss out on signing incentives like rent concessions or other benefits that are only available to long-term lessees. Instability: In an MTM, your landlord can increase your rent each month, and without much notice, depending on your area. Similarly, your landlord can terminate your contract and evict you, generally without cause, with little notice (30-60 days). Further, during that period, the landlord can show the home to prospective tenants, which is a big hassle. Flexibility: With a MTM, it is much easier to evict a tenant in the event they are late with rent payments, are not taking proper care of the unit, or are not following local codes and ordinances. You can also raise rents more frequently as the rental market adjusts. Raising rents require only 30 or 60 days notice (depending on where you live), so as demand increases, you can more quickly respond by increasing rent and thereby maximize your profit. Furthermore, if you are unsure about your future plans for your rental property, MTMs grant you the flexibility to act whenever you decide. Say, for example, you are considering selling or renovating the property. With a MTM, whenever you decide how you want to proceed, you can act quickly, rather than having to wait months for a long-term lease to expire. Flexibility (for tenants): On the one hand, the flexibility of a MTM allows you greater flexibility to adjust rent and choose tenants. On the other hand, it also affords greater flexibility to tenants to leave at any point. Therefore, MTMs increase your opportunity to maximize profit but also increase the possibility your unit remains vacant (and therefore does not generate rental revenue) for extended periods. This can function as a sort of check and balance on rental increases. Regardless of what your tenant can afford, if you are constantly raising rents, they’re likely to vacate. Eviction: In theory, a MTM gives you greater authority to evict undesired tenants. However, depending on where you live, there are generally still tenants rights laws you have to abide by, regardless of the term of a rental agreement. These laws outline when you can, and cannot, evict a tenant. Therefore, some believe the eviction process may not be any easier with MTMs. Non-payment of rent: in this scenario a landlord must initiate a formal eviction process whether the tenant is in a MTM or long-term lease. Property Damage: Both MTMs and long-term leases have language that permits eviction in the event the property is damaged. Criminal/Police Issues: Most courts accept a police report as a valid reason for eviction. Neighbor conflict: if your tenant’s actions prompt a neighbor to call the police, and they have a valid reason for doing so, the landlord often has the ability to evict, regardless of the lease term. Tax Deductions: Homeowners can deduct, up to a certain amount, property taxes and their mortgage interest from their taxable income. Remodeling Freedom: As a homeowner, you can do whatever you want to your house (so long as it complies with local zoning and building laws), without permission. Renovations and remodeling, moreover, typically increase the value of a house. Equity: Although there have been a few high-profile housing market collapses (e.g. 2008), on the whole and over the long-term housing is usually a good investment. As an owner, therefore, you are likely to accrue significant equity through homeownership. Expenses: Sure you can deduct the mortgage interest and property taxes, but you still have to pay them each year, which amounts to thousands of dollars renters simply are not on the hook for. Additionally, there are significant up front costs--closing costs, inspector’s fees, etc.--you likely will not recover in equity for several years. Therefore, if you plan to live in an area for a short time, purchasing may not be the best option. Maintenance: As a homeowner you, rather than a landlord, is responsible for all maintenance and repairs to your home. Flexibility: Renting, especially with a MTM agreement, affords you the flexibility to move at will and with minimal notice and expense. Free maintenance: If something breaks in a rental, your landlord is responsible for covering the cost of repairs, scheduling service, etc. Cannot personalize the space: Yes, you can furnish the domicile as you choose, but you cannot renovate, upgrade, or even paint without the permission of your landlord. No Equity: Any equity accrued in the domicile while you live there is the landlord’s, not yours. Additionally, unlike mortgage payments, you will never recoup any of your rent money. No tax breaks: Unlike mortgage interest, your rental payments are not tax deductible. Here is our guide to month to month lease agreements (MTMs). We cover the basics of a MTM, compare them to long-term lease agreements, and offer a list of pros and cons (for both landlords and tenants) for each. We also cover the pros and cons of a MTM versus purchasing a home. We hope this guide helps you diagnose whether or not a MTM is right for you. This is generally the first section of the month-to-month lease agreement part should disclose the full legal names of the landlord and tenant, as well as the address of the apartment in question, the name and address of the apartment management company, and everybody's contact information. This section should specify the month-to-month basis of the lease, as well as name rent amount. It should also detail the grounds on which the lease may be terminated, both by the landlord and the tenant. If lease renewal is an option, it's terms should be also be explained in this section. Pretty self-explanatory - this section should name the security deposit, as well as the amounts of any other applicable deposits (such as a pet deposit). It should also detail any fees charged for late or returned payments. The amount of rent due each month should be clearly described in the contract, as well as the date the rent is due. Not all apartments allow pets. Some tenants run into issues because they live in an apartment for a period of time, and then decide to get a pet. However, before you decide to get a pet (if you don’t already have one) be sure that your lease agreement highlights the parameters of having a pet in the home. Sometimes a “pet deposit” is required to cover any additional cleaning fees, and other times rent may increase to accommodate any additional wear and tear to the unit. This clause should outline how any damage to the property will be handled. This will describe what privileges the tenant will have on the property. This should highlight which parking spaces (if any) the tenant will use, if he or she will have any on-site storage units, and whether or not the tenant can have extended guests or sublets. The month-to-month lease agreement should include subsections on any of the following that apply: damage fees, utilities terms, landlord's right of entry, and any required renters insurance. When should I opt for a Month to Month Lease? Although opting for a month to month lease comes with its share of pros and cons, having one gives flexibility to those who may have taken a temporary job, or may be working in the area on contract for a period of time, or for those who simply may not know when they want to move. Renters typically opt for a month to month lease because of its flexibility. Many on a month to month lease may only wish to rent an apartment because their job is only temporary, or they are under contract to work in a particular city for a period of time. Rather than spending money on a costly hotel, that may have limited amenities such as a stove or an actual bedroom, many will opt for a month to month lease. For others who may be looking to purchase a home but do not know exactly when, a month to month lease gives them the flexibility to look for homes on their own schedule, without worrying about feeling rushed to purchase something before their lease ends. One of the highlights of signing a month to month lease is the flexible end date. Renters have the flexibility to end their lease in 30 days with no repercussions. Month to month leases automatically renew at the beginning of each month and the lessee is not locked into a long-term stay. One of the main drawbacks of a opting for a MTM lease is the fluctuating rent prices and the possibility of an unexpected lease end. With fixed term leases, your rent is locked in for the duration of that lease (unless otherwise described in the lease). However with a MTM, the landlord may decide to raise the rent month after month, with the new rent amount being due 30 days after the initial notice. Additionally, if there is no rent control over the property, the landlord can raise the rent how he or she chooses. How do I find a MTM lease? Although some units may be advertised as MTM-friendly, your best bet is to ask the landlord if they are open to a MTM agreement. If possible, offer to pay more than the advertised monthly rent. This can serve as an attractive compromise for the owner, who may be willing to sacrifice the security of a long-term agreement for more money each month. You should also look for rentals that have been on the market for a long time. Landlords tied to these units are more likely to negotiate in order to fill their empty property. Do I need a written contract for a MTM lease? Every lease should be detailed in writing and signed by both the landlord and tenant to ensure it is legally binding. The exception to this is a Holding Over clause, which stipulates a long-term lease will continue on a MTM basis after the lease expires. In this scenario, you do not need to sign another document once the lease converts to a MTM. The Holding Over clause protects landlords in the event a tenant does not vacate at the conclusion of the fixed-term. In this case, which is very common, the lease converts to a month to month lease rather than becoming void and requiring a new contract. Notice to terminate a MTM lease agreement varies by state, but typically both tenant and landlord must provide 30 days notice in order to terminate a MTM agreement. MTM agreements are an attractive rental option...for some. As we’ve outlined in this guide, whether or not a MTM is right for you depends on a host of factors. We hope this guide helps you get a better sense of your own needs and priorities regarding a rental contract. 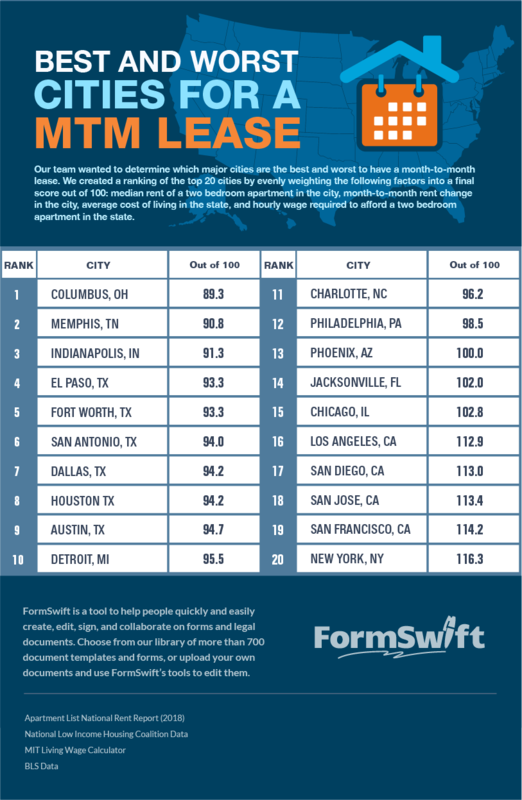 Our team at FormSwift wanted to determine which major cities are the best and worst to have a month-to-month lease. We created a ranking of the top 20 cities by evenly weighting the following factors into a final score out of 100: median rent of a two-bedroom apartment in the city, month-to-month rent change in the city, average cost of living in the state, and hourly wage required to afford a two-bedroom apartment in the state. A month to month lease agreement is used by landlords and property managers to enter into an agreement with a tenant to lease property on a monthly basis instead of a yearly basis. A month to month lease agreement has the same provisions as a traditional lease, but the term is significantly shorter. This legally binding agreement between a commercial landlord and a business establishes terms of lease for a commercial property. It is pre-negotiable. In the event of a breach of a Tenancy Agreement or Lease Contract, a landlord may use an Eviction Notice to notify the tenant of their obligation to vacate the premises. A Limited Power of Attorney form details the scope of authority granted to a trusted 'attorney' by a 'principal'. It covers specificed contingencies in the eventuality that the Principal cannot act on their own behalf for whatever reason. It covers term of delegated authority, amount and regularity of delegated actions, and limitations to powers.